What is it called when you switch out one letter at a time in a word in order to get to a different word? Our new white roof is excellent. People were asking for photos, but there are none to share… We only replaced the flat roof on our home’s addition, which is not visible from below. It has made a huge immediate difference in the temperature of the second floor though! We’re so glad we went with white. And the chicken coop? I’m still keen on the idea, but Brandon is most certainly not. Therefore we will not be adding chickens to our household. Maybe when Eleanor is older (maybe? ), but definitely not in the near future. Love it. What font is the word “buk” in? not to rain on your parade but the hubby & i are actually getting 3 chickens today. This is a hubby project because I have enough to handle. I’m looking forward to this. He built a cute little A Frame coop and we have a fence around them. Hopefully it goes well. Sometimes you never know! And maybe one day your hubby will change his mind. And on Eleanor’s monthly pictures are so darn cute! Check out bantam chickens…take less space, still give great eggs (only a little smaller), and wonderfully hardy and resourceful. They like to brood, if you want some replacements, too. We have Buff Brahma Bantams, and love them! Is it a spoonerism? like lead of hettuce? I loved your chicken coop post. I have been wanting chickens for quite sometime and had no idea there were such cute options. But like Brandon my Adam has firmly put his food down and doesn’t want any chickens in our back yard. But I am think this might be a long term nagging investment :) maybe in five years or so. Funny you and dooce both mention a love of chicken coops (and husband hatred of them) when my husband has recently been begging me to let us raise chickens when we eventually get a house. I’m sooooo not interested, though I’m otherwise all about the urban homesteading. I just… really don’t like chickens! But who knows, maybe some day he will win out and we’ll try. I found you yesterday through GirlsGoneChild. I love your blog and home. It’s beautiful. So many beautiful ideas. Thanks for sharing your life with all of us. Ever since you posted that Omlet link, I’ve been stalking their site and dreaming about a coop! Well, you might not be getting chickens, but I think that adorable post inspired us to maybe be getting them! I showed the ultra-cool coops to the husband, and he didn’t even need to see them to be on-board with the idea. I just have to find a way to make it super-chic.. we live in the country but I am decidedly not rural. I want chickens, which is odd because I’m afraid of birds. Our neighborhood gets the occasional bear though, so I’m not sure leaving a cage full of food out for them is the way to go. My mother-in-law is retired and recently set up her chicken coop. One day she came out to find a stray chihuahua had gotten in. The chickens gave him a pretty good walloping. He hasn’t come back. One thing that people never tell you when you get chickens is that they attract mice and rats! That is never fun! I had a moment recently when I thought – chickens – what a great idea! My dad burst my bubble when he reminded me that our fine feathered friends are sometimes cesspools for disease (think SARS and bird flu). Just that thought, coupled with Kylie’s about mice and rats – ugh! I don’t think I’m cut-out for the countrified life. 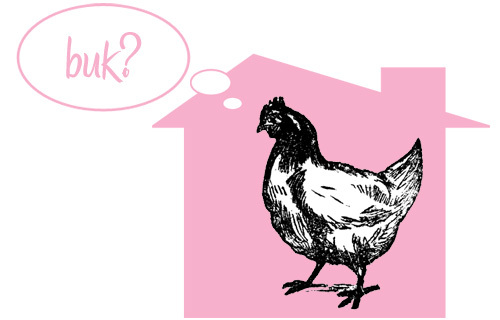 But love the house/chicken graphic! Chickens are such intelligent, interesting animals. I’m sorry you won’t be able to enjoy them :( but totally get that they’re not for everyone! I don’t have any now, but as soon a we flee the DC suburbs I will be getting some!